Last year Mars Global Surveyor spotted terrains on Mars that look like sedimentary rock deposits. 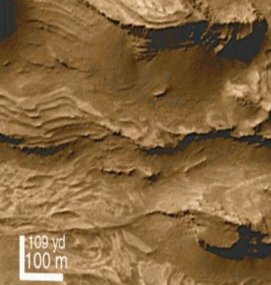 If the mysterious layers formed underwater, as some scientists suspect, they may be a good place to hunt for Martian fossils. January 23, 2001 -- Layered terrains on Mars discovered just last year by NASA's Mars Global Surveyor spacecraft bear a striking resemblance to sedimentary deposits here on Earth that form under water. Liquid water is scarce on Mars nowadays, but it might have been common four billion years ago. If these Martian layers turn out to have a watery origin, as some scientists suspect, they could hold the key to the mysterious history of water (and maybe even life) on the Red Planet. Studying Mars's sedimentary deposits, if that's what they are, could tell scientists if water existed on Mars long enough for primitive life to begin. Indeed, the layered rocks themselves may be the best places to go fossil hunting. "One of the reasons that we get so excited about the layers is that they could imply water was there for a while," said Ken Nealson, director of the Center for Life Detection at NASA's Jet Propulsion Laboratory.
. 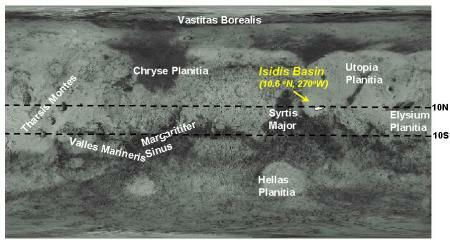 Image courtesy NASA/JPL/Malin Space Science Systems. 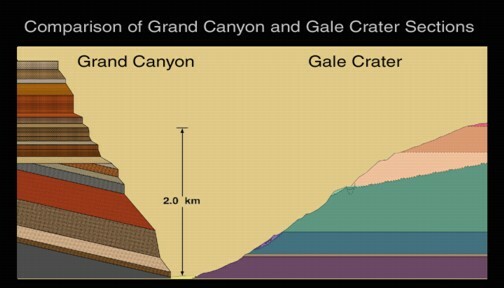 Large sedimentary deposits on Earth often take millions of years to accumulate. As tiny bits of sand or dust sink under water they settle in layers. Pressed upon by their own weight and that of the water above them, the layers grow steadily thicker and harder with the passage of time. The color and texture of each layer depends on the chemistry of the water and the make-up of the sediments when they settled. If the Martian deposits settled in similar fashion out of long-gone ancient lakes, it could mean that the lakes were around long enough for microbial life to arise -- a process that took roughly 500 million years on Earth. Sedimentary deposits are places where our planet's fossil record is stored, so they are probably good places to hunt for fossils on Mars, too, added Nealson. Unfortunately, single-celled microbes -- the most likely forms of life on ancient Mars -- rarely fossilize. Their small, soft bodies usually decompose before fossilization can occur. "It's unusual (to find fossils of bacteria), but if you get enough stuff being deposited, you usually get some circumstances where you'd find them," said Thor Hansen, professor and chair of the geology department at Western Washington University. For now, the challenge facing scientists is to determine whether the sedimentary deposits seen on Mars are in fact the remnants of ancient lakebeds or seafloors. "You have to be careful. Just because there are some layers, that doesn't prove there was an ocean basin and sediments deposited there," Nealson said. "You can look around on our planet and see a lot of examples of things that form layers -- everywhere from the geyserite deposits in Yellowstone to layers of variation that come from forest fires or volcanos ... there are all sorts of things." Clues in the rocks themselves will help scientists determine whether the layered features on Mars were deposited by water or by some other agent. Wind is a primary contender. Mars today has only a tenuous atmosphere, less than 1% as thick as Earth's, but if the Martian air had been much denser billions of years ago winds might have carried dust grains aloft and deposited them in places where the wind speed dropped. As these deposits became buried, pressure from the covering material's weight would begin the transformation to sedimentary rock. Because wind can carry only very small dust particles, while water can transport larger ones, geologists would expect wind-laid sedimentary rocks to contain relatively small grains. Measuring the sizes of grains in the Martian deposits will provide important clues about their origin. Some of these data will be gathered by upcoming missions to Mars. 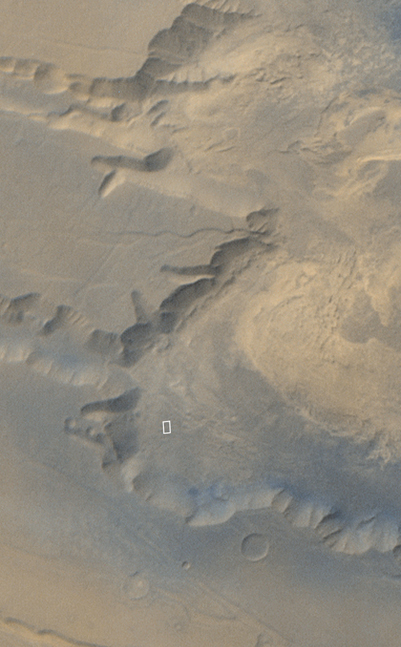 , an area of the Martian surface near 10 degrees North latitude. This landing site was not among the sedimentary regions discovered by NASA's Mars Global Surveyor, but researchers believe the site is a sedimentary basin that may harbor the telltale signs of water or possibly of ancient life. will carry instruments that can bore into rocks and burrow into the soil to gather samples. These samples will then be analyzed for the presence of water, carbonates and complex organic molecules, which are considered indicators of past life. The spacecraft will also wield a microscope camera with an 8 micron resolution that could provide data on grain sizes in the sedimentary rocks. "The stereo cameras, which have a close-up lens, and the Beagle 2 microscope may be able to tell (whether the deposits were water-laid or wind-laid) from rock and deposit morphology, i.e., structure," said Mark Sims, project manager for Beagle 2. 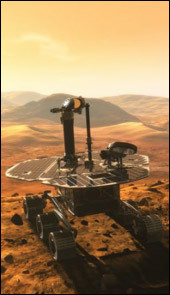 A pair of NASA rovers are also slated to land on Mars in 2004. 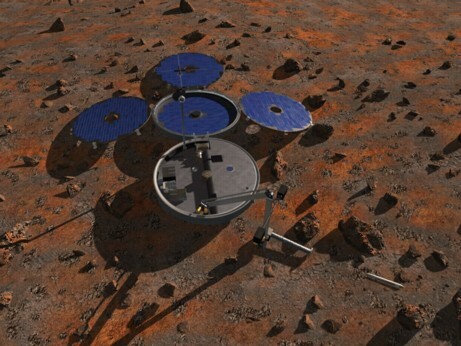 The Mars Exploration Rovers will carry scientific instruments similar to the ones on Beagle 2, but they will have an added advantage: they can drive toward desirable locations for sample-taking. With both NASA and the ESA heading for the Red Planet, a solution to the mystery of Martian layers might be just a few years away. All rocks disintegrate slowly as a result of weathering. The term "sediments" is the general name for fragmented rock particles of different sizes. Sediments can be composed of clay, silt, sand, or gravel, almost all of which are shown in this picture (left). When sediments sink under water or are laid down by the wind, they accumulate in layers, one on top of another. As years pass by, the layers become thicker and thicker. They are pressed down by their own weight, or by the weight of the water on top of them. The packed layers become very hard, and turn into rock. Sedimentary rock can be made of tiny bits of other rocks and stones. They can also be made up of very small old bits of plants or animals, such as ground up bone or shells. Sedimentary rocks can also be made from salts that wash out of other rocks that are covered by water. The many kinds of sedimentary rocks have names such as sandstone, limestone, shale, gypsum and even rock salt! Most sedimentary rocks have layers in them that you can see, like a sandwich. This often makes them easy to break or crumble. Many sedimentary rocks, such as sandstone, are very pretty because of all the different colors and stripes you can see in them. Sedimentary Mars -- Science@NASA article: New Mars Global Surveyor images reveal sedimentary rock layers on the Red Planet that may have formed underwater in the distant martian past. The Case of the Missing Mars Water -- Science@NASA article: Plenty of clues suggest that liquid water once flowed on Mars --raising hopes that life could have arisen there-- but the evidence remains inconclusive and sometimes contradictory. Twin Rovers Headed for Mars -- Science@NASA article: NASA announced plans to launch two large scientific rovers to the red planet in 2003.